Snaps, no. 8: Cax aside all fear. Evangelist Sarah Henderson Jacobs Silver with her Bible, circa 1931. The boy is her great-nephew, Lucian J. Henderson. This photo appears to have been taken at the same time as this one. I have written here of a Bible (not the one shown above) that once belonged to Sarah Henderson Jacobs Silver. When I first thumbed through the Book in the early 1990s, I found two scraps of paper stuck deep in its chapters. Sarah had left the Congregationalism of her upbringing and joined the Holiness movement sweeping the country in the early 1900s and pencilled in a square, unsophisticated hand were these bits from her sermons. 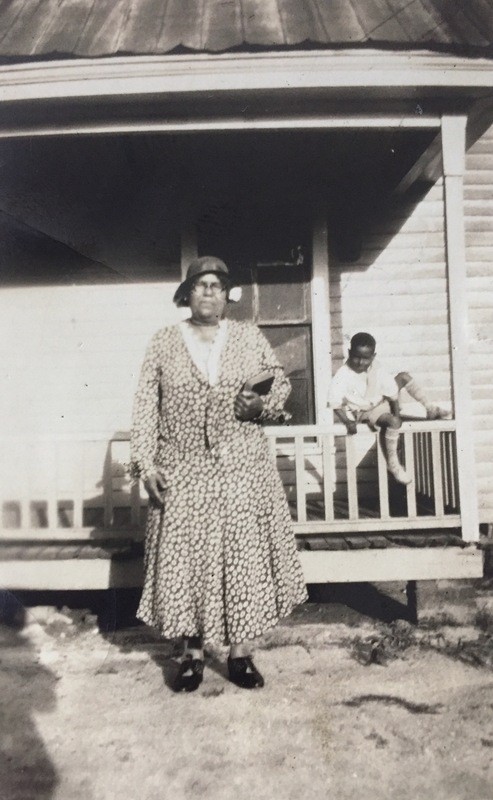 Hattie Henderson Ricks recalled: “Mama’d make us go to Holiness Church and stay down there and run a revival two weeks. And we’d go down there every night and lay back down there on the bench and go to sleep. … Mama’d go every night. And they’d be shouting, holy and sanctified, jumping and shouting.” She did not recall the name of the church, which was located on Lodge Street. This 1933 Sanborn insurance map may provide an answer. Mount Zion Holiness Church is shown in the block of South Lodge between Walnut and Banks Streets. The area was cleared in the 1960s to make way for the Whitfield Homes housing project. 1933 Sanborn insurance map, Wilson. Sarah Henderson Jacobs apparently met her second husband, Rev. Joseph Silver, founder of one of the earliest Holiness churches in eastern North Carolina, on the revival circuit. They married 31 August 1933 at her home at 303 Elba Street and divided the five years before her death between Wilson and his home in Halifax County. Interview of Hattie Henderson Ricks by Lisa Y. Henderson, all rights reserved; photograph in the possession of Lisa Y. Henderson. ← Aunt Charlotte’s excursion tickets.